WATERLOO – Ontario Minister of Agriculture, Food and Rural Affairs Jeff Leal will visit Laurier’s Northdale community garden Tuesday, Sept. 1 at 1:30 p.m. The event will be open to media and the public. The community garden is run through a partnership between Laurier’s Sustainability office and local non-profit Young City Growers. The program provides paid internships in garden management and cultivation to urban youth. The garden is located behind Laurier’s Northdale location at 66 Hickory St. West in Waterloo. 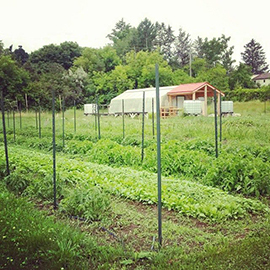 Constructed in 2013, the community garden was made possible when Laurier provided previously unused field space and a greenhouse to Young City Growers, who began using the land as a community shared agriculture space, growing fruits and vegetables. The garden now produces several bushels of fruits and vegetables per week, which members of the Laurier community can register to receive. Since creating its Sustainability Office in 2010, Laurier has made significant strides in improving its environmental sustainability. In 2014, the university received the Greater KW Chamber of Commerce’s Environmental Sustainability Award.